Geps Techno recently named its new power platform WAVEGEM. Designed and built in Saint-Nazaire, France, the platform is a part of the R&D project IHES (Integrated Harvesting Energy System) which includes partners as Blue Solutions by Bolloré, Centrale Nantes, Chantiers de l’Atlantique, ICAM, Ifremer, SNEF et financed by Bpifrance PIAVE and INTERREG FORESEA. 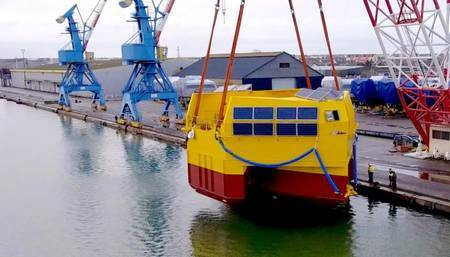 The 200-ton unit measures 21 x 14 x 7 m and is equipped with 150 KW power capacity, designed to produce energy courtesy of waves and sun. It is starting an 18-month test period on the site of SEM-REV operated by Central Nantes and located off the coast of Le Croisic in France. The system to convert waves energy into electricity relies on a smooth sea water flow through a turbine, with the constant water flow in different corridors enabling the platform to deliver consistent power. To increase the production of electricity, theunit is equipped with 70 sq. m. of solar panels. WAVEGEM is designed to be a simple and reliable, anchor-moored system to deliver energy to multiple applications on site. With the unit Geps Techno aiming for a power range from 150 kW to 1 MW to provide off-grid power solutions to a variety of offshore industries, from oil & gas, aquaculture and wind farms.